This morning I was listening to a podcast I like, Lynn Rossetto Kasper’s Splendid Table. She off-handedly mentioned something about a curry using coconut milk, chiles, and chicken and with that I had tonight’s dinner puzzle solved. I love a good, spicy curry, regardless of the weather. Today New York City was a ripe summer day, the humidity somewhere near 90% — perfect curry-eating weather as far as I’m concerned. When Yuji and I were in the Maldives in January we ate curry every day in 90-degree heat. Somehow it works. You know how oenophiles will tell you to pair wine with whatever food you’re eating? A spicy wine with spicy food, a rich one with a rich meal, etc. Well perhaps it’s like that with curries and weather: a hot curry on a hot evening? I was en route to the co-op this afternoon to stock up on groceries for the week. You take your chances when visiting the co-op on a Sunday. It can be hairy in there navigating tight aisles with Slopers reaching over you to grab their favorite goat-milk yogurt or stretching to fill a plastic baggie with pecan splendor granola. Today for some reason the co-op was pleasantly calm and air-conditioned. I dawdled in the bulk spice section, marveling at the bargains. 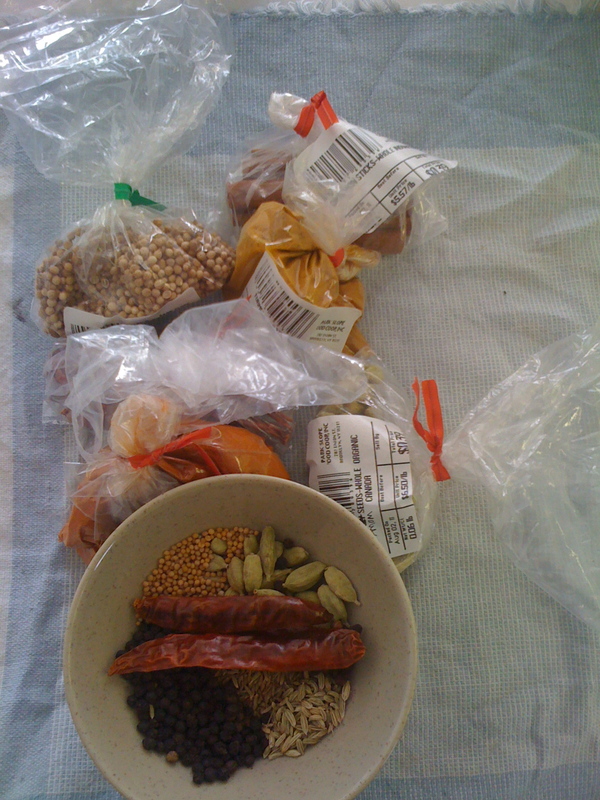 I needed a lot of spices because I planned to make my own curry powder, or garam masala. For that you need coriander seeds, cumin seeds, cardamom seeds, whole black peppercorns, fennel seeds, mustard seeds, whole cloves, dried red chiles, and turmeric. Once home I began assembling, toasting, chopping, and stirring. While you can buy curry powder pre-made, making your own garam masala will improve the quality of your curry. You can make it as spicy as you want, using more or less chiles, and store the leftovers sealed in a glass jar for up to a couple of months. 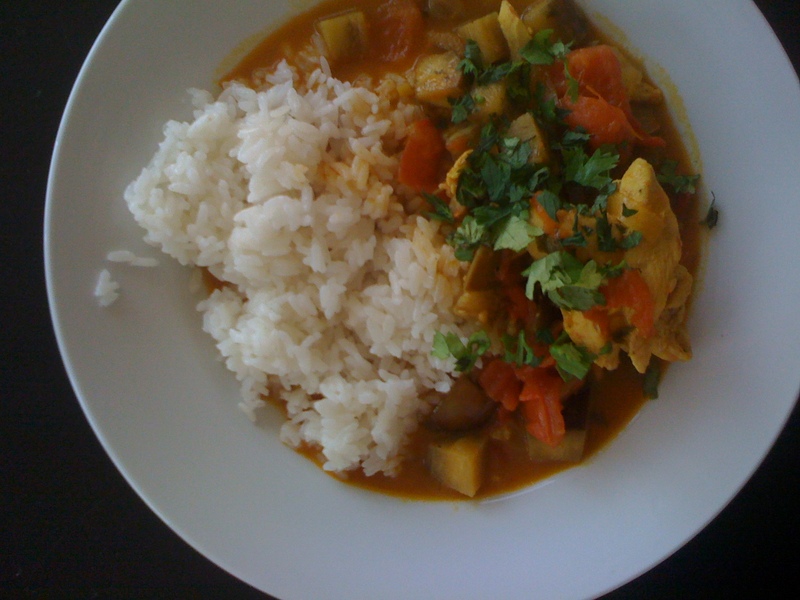 I based my curry on Tyler Florence’s recipe for Spicy Chicken Coconut Curry. It would be easy to make this dish vegetarian by substituting tofu for the chicken, or just adding more veggies. Toast all the ingredients except the turmeric in a small cast-iron skillet for 2-3 minutes on low-medium heat, just until they begin to toast and smell fragrant. Let cool then transfer to a coffee grinder and blend to a powder. 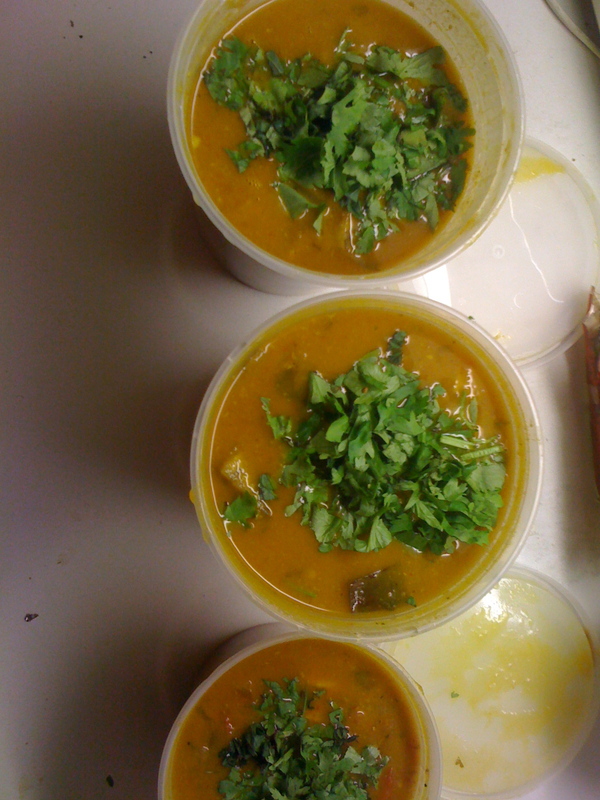 Combine with the turmeric, set aside 2 tbsp for the curry and store the rest in an air-tight container. Yields about 1/2 cup. 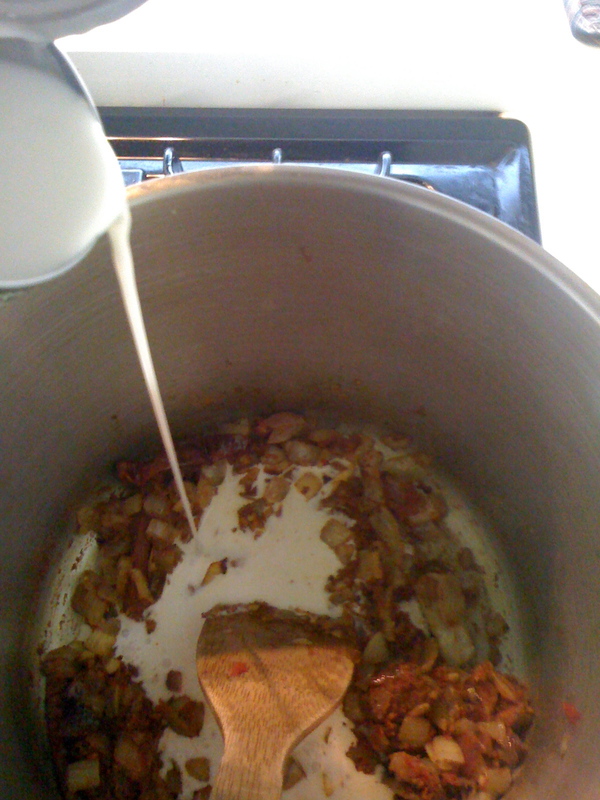 Melt the butter in a stock pot over medium heat, when warm and melted add the onions and ginger and cook slowly until the onions are very soft, about 10 minutes. After about 5 minutes stir in the garlic. Add the tomato paste, curry powder, cinnamon stick, and chiles and stir; season with salt and pepper. Pour in the coconut milk and chicken stock and bring to a simmer; cook until the sauce has thickened, about 20 minutes. Add the tomatoes, eggplant, chicken, cilantro, half the lemon juice, and simmer for about 20 minutes. Taste and adjust with more lemon juice, salt, and pepper. Garnish with more cilantro and mint leaves. Oh and the other thing about curries, they taste even better the next day. Good thing I have lots of leftovers. That looks amazing! I wish I could have some of the leftovers!